There has been speculation in the Israeli media that close ally United States will pull out of the Iranian nuclear deal on May 12 and impose sanctions against the Islamic Republic. 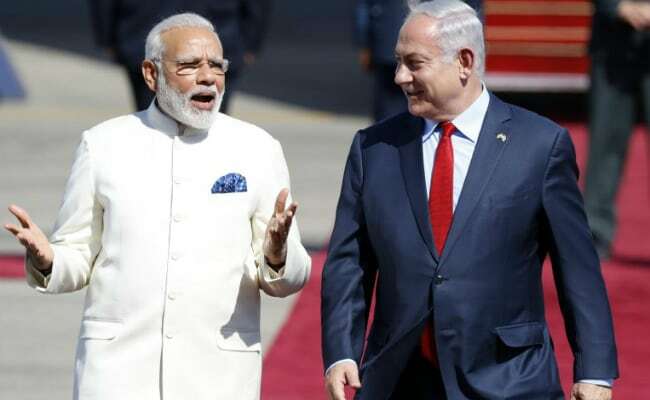 Jerusalem: Drumming up international support for his call to "fix" or "nix" the Iran nuclear deal, Israeli Prime Minister Benjamin Netanyahu has reached out to Prime Minister Narendra Modi to update him on the recent developments. A statement from Mr Netanyahu's media advisor on Friday said the Israeli prime minister spoke to three key international leaders, including PM Modi, Australian Prime Minister Malcolm Turnbull, and British Prime Minister Theresa May. He discussed regional issues with the world leaders and also updated them on the important material that he revealed regarding the Iranian nuclear archive, the press release stated. Mr Netanyahu had earlier told the media that he would share the archive of more than 100,000 documents said to have been obtained by Israel's espionage agency Mossad from a Tehran warehouse, which allegedly proves Iran's past clandestine efforts to assemble nuclear weapons. "The leaders of the E3 - Britain, France, and Germany - said they want to see the material. They're very interested in seeing what we discovered," Mr Netanyahu told journalists in his Jerusalem office. Intelligence professionals from London, Paris and Berlin are coming to Jerusalem later this week to examine the material Israel presented, he said. The Israeli Premier spoke to French President Emmanuel Macron, Russian President Vladimir Putin and German Chancellor Angela Merkel to update them about the Mossad's findings on Monday. "I told Putin that he's welcome, too, to see the material. I also invited the leader of China and [Yukiya] Amano (the head of the International Atomic Energy Agency)," Mr Netanyahu said. In a presentation on Monday evening, Mr Netanyahu showcased an enormous trove of Iranian documents that he said proved the existence of Iran's nuclear Project, Amad, which Tehran claimed to have frozen in 2003. In a daring operation, Mossad agents are said to have managed to obtain and smuggle into Israel 55,000 paper documents and 183 CDs with another 55,000 documents from what looked like a "dilapidated warehouse" in Tehran earlier this year. Israel has expressed hope that the "irrefutable findings" would help shore up international community's longstanding suspicion that Tehran was investing great efforts in building a nuclear weapon. There has been speculation in the Israeli media that close ally United States will pull out of the Iranian nuclear deal on May 12 and impose sanctions against the Islamic Republic "based on the reactions coming from Washington on the proof gathered by Mossad". Commenting on the expectations, Mr Netanyahu gave a guarded response saying, "The decision is President [Donald] Trump's decision alone. He's a leader who knows to take decisions, and he takes them". Mr Trump, a fervent critic of the seven-party agreement, has long threatened to walk away from the landmark deal unless its European signatories and Congress reconcile his concerns. The US President is said to be unhappy about key aspects of the "insane" pact. He has complained that the deal fails to restrict Iran's nuclear activities for long enough and to stop the country's development of ballistic missiles. A dramatic uptick in oil prices in recent weeks has partly been driven by mounting expectations that Trump will soon pull out of the 2015 accord. The Iran nuclear deal framework was a preliminary framework agreement reached in 2015 between the Islamic Republic of Iran and a group of world powers - P5+1 (meaning the five permanent members of the UNSC and Germany) and the European Union. Some critics have downplayed the claims by Israel and termed Mr Netanyahu's press conference "theatrical" arguing that the existence of Iran's clandestine nuclear weapons programme was already known and detailed in an IAEA report from 2011. Israeli officials have refuted such critics saying that the world now has much more detailed knowledge of what went on there with "evidence of a whole different level".